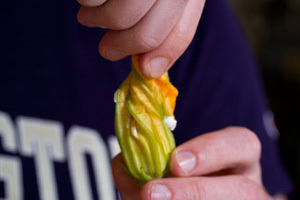 Stuffing squash blossoms is one of the most common ways these delicious edible flowers are prepared. Usually the filling has a cheese base, you can probably use any ricotta-based ravioli filling recipe for squash blossoms. Chefs most often use a pasty or piping bag, but you if you don’t have one on hand you could put the filling in a zip-top bag, push out all the air, and snip one of the corners off with a pair of scissors as a substitute. 1. Fill a pastry bag or zip top bag with your filling (either without a metal tip or using a large round tip). Hold the back of the bag, where the filling stops, and press with your whole hand (rather than just your fingers) for slow, even pressure. 2. 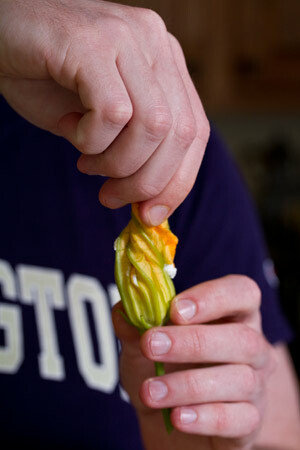 Gently fill the center of each squash blossom about half way (see photo reference). 3. Twist the petals around the filling.